Nothing too surprising here, with 0.5mm a clear winner, and 0.7mm an easy second. I was a little surprised at the size of “the tail” – 0.9mm and bigger getting a combined 28% of the vote. A few manufacturers push 0.7mm over 0.5mm leads due to strength issues, but you could interpret this poll to imply it’s not that big a deal. On the other hand, voters on this poll might not be representative of the pencil using population at large and so skew the results towards 0.5mm. Now hopefully I’m not going to go overboard on polls, but I’ve got a couple more questions coming soon. Second in my series of holiday mini-pencil reviews is the “Mini M.V.P.” AL17MN from Pentel. It’s available in a selection of body colours, but 0.7mm lead size only. Now normally I’m a 0.5mm person, but I actually think 0.7mm might be a better choice for mini-pencils. A few quick notes, a scrap of paper on a imperfect writing surface, you’re in a hurry, a small pencil that isn’t the “perfect” fit in your hand, - all these sort of things combine to suggest to me that a bit of extra strength in your lead might be a good thing, hence 0.7mm rather than 0.5mm. 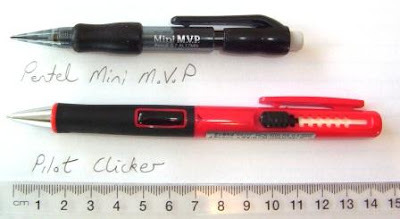 The Mini MVP looks like a cut-down version of several Pentel pencils, particularly the Pentel Champ AL17. This tends to give it a rather compact, no-nonsense “busy” look in comparison to many other mini-pencils which are often rather smooth or plainly shaped. It’s basically a normal width pencil, just shorter than normal. As such it might not be the greatest at fitting inside your notebook or compendium. The shaped rubber grip is a compound with some “stick”, so it does improve your grip, but from just lying around and a bit of time in a shirt pocket, the grip quickly picked up its fair share of dust and lint. Being black this tended to show, and I didn’t really like the look. 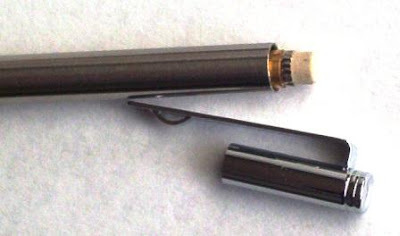 Speaking of pockets, like most Pentels the tip is not retractable, so again I wouldn’t class this pencil as (trouser) pocket safe although it’s fine in a shirt pocket. The plastic pocket clip is quite reasonable, for a plastic clip. The pocket clip and top section push fit onto the main body, so possibly over the very long term they might tend to come apart. This is a push top ratchet mechanism pencil – 10 clicks for 7mm of lead advance. The top cap includes an uncovered small eraser. You pull the eraser out to access the lead refill chamber. The rubber grip does give you some sense that you are writing with a normal size pencil, but as usual those with very large hands will struggle. I’ve got to admit that something about the Mini MVP just didn’t gel for me. Just not quite right. I think it was a sort of optical illusion, the normal width and “look” of the pencil just didn’t produce the right “feel” in the hand – maybe my eyes were telling my brain to expect "normal", but my hand was saying “it’s just a little shorty”. A clash of messages? But putting that aside, the Mini MVP was definitely easier to hold than the thin mini-pencils like the Pilot Birdie. Best Points – The rubber grip for those who like them. Not So Good Points – Not entirely pocket safe. Dimensions – Length 110mm, diameter 12mm at widest part of grip section. Balance point - irrelevant. My thanks to Julia and others who sent me this video link on using a pencil as an emergency light source. Actually, I seem to think I've seen this video or something like it before, but its good to see again. Umm, kids don't try this without adult supervision. Actually, I'd just probably stick with "don't try this", irrespective of your age. Its bonus time - two reviews for the price of one! Well, I’ve just recently been on holiday in Australia and it seemed a good time to put a few mini-pencils through their paces. First up we have two somewhat similar pencils, the Zebra T3 and the Pilot Birdie. Photo: Pilot Birdie (top) and Zebra T3. Zebra T3 Pocket Pencil Mechanical Pencil Review The Zebra T3 Pocket Pencil is very small – at 100mm (4in) long and a very slender 5mm (< ¼ in) in diameter, you’ve got to look pretty hard to find something smaller. The T3 is an all-metal (lightly brushed steel body, polished end-pieces) push top ratchet 0.5mm pencil. It has a short little 1.5mm lead sleeve at the tip so it’s not really (trouser) pocket safe, despite it being called “Pocket Pencil” on the Zebra website. Being so slim and a reasonably smooth steel body, it’s never going to win the “good grip” award. In fact I imagine those of you who wear size X-Large gloves would possibly rate the T3 as unusable. For someone like me who is in the medium hand size range, you wouldn’t want to be writing any long novels with the T3, but clearly this is not what the T3 was intended for. Obviously it is a short slim pencil to fit unobtrusively in a notebook or compendium, so that you can jot down a few short notes here and there. At this, it is quite good, but I do have one significant reservation - the pocket clip. The pocket clip is part of the push top button and it doesn’t really fill me with confidence. As normal, you pull the push top button off to reveal a very small eraser, and then remove the eraser to refill the lead chamber. The problem is, it doesn’t seem too much of a leap of imagination to see the push top button coming off at an inappropriate time and therefore the main body of the pencil will just fall free. Lost. Gone. Best Points – extra small and slim to fit in your compendium. Not So Good Points – extra small means a bit hard to hold for longer periods of time, and I’m uneasy about its security when clipped to a pad or folder compendium. Despite its small size, I wouldn’t really put the T3 in a trouser pocket. Dimensions – Length 100mm, diameter 5mm. Balance point – irrelevant. Note: I’m not sure of the T3’s proper designation – some sites call it T3, others TS-3, but they appear to be the same pencil. The Pilot Birdie is reasonably similar to the Zebra T3. It’s a little bit longer, but still very slender. I wouldn’t be surprised to find that the main bodies of both the Birdie and the T3 are made from the same standard size seamless tube. The Birdie is a push top ratchet 0.5mm pencil, but not quite “all-metal” as there is a thin black plastic washer visible where the tip section screws into the main body. Like the T3, the Birdie has a short 1.5mm long lead sleeve at the tip so it’s not really pocket safe. I’m not quite sure why the designers of both of these pencils went for this short sleeve – why not make it retractable or do away with it entirely? As expected, you pull the top cap off to reveal a very small eraser, and remove the eraser to refill the lead magazine. Now for an important difference – unlike the T3, the Birdie’s pocket clip is welded direct to the main body, like “normal”. Gone are my worries about the pencil detaching and not being where I clipped it. Just for the record, the Birdie clip might be small, but it’s a good strong clip. Again as a small slim pencil the Birdie is never going to be the greatest for grip and feel, but having said that, I must compliment Pilot on somehow making it look and feel surprisingly substantial. By polishing the end-pieces and using a black washer they have done what they can within the very limited confines of a simple metal mini-pencil. Best Points – Overall its just a little bit “more” than the T3 – it both looks and feels that little bit more substantial. 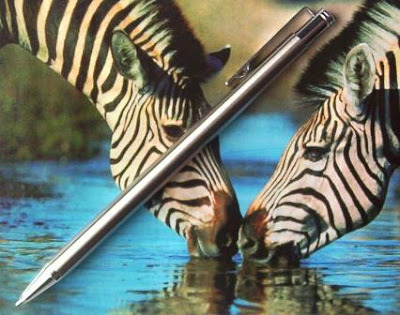 Not So Good Points – Similar to the Zebra T3 - extra small means a bit hard to hold for longer periods of time, and I wouldn’t really put it in a trouser pocket. Dimensions – Length 111mm, diameter 5mm. Balance point – who cares? The Final Verdict – personally it’s not much of a contest. 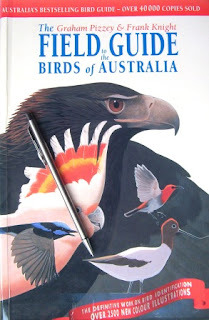 If you want a slim mini-pencil to fit in your notebook, filofax or other such compendium then I’d choose the Pilot Birdie. Photo: A relatively “normal” size Cross ballpoint pen with Pilot Birdie and Zebra T3 to illustrate just how slim these two pencils really are. Credit: Both the Pilot Birdie and Zebra T3 were given to me as freebies by Cult Pens in the UK. But no strings were attached – I was free to like or dislike them, review them or not. I know I’ve seen something on this before on some websites or blogs, but no law says I can’t repeat things. A generous reader recently sent me this little strip of 2 self-adhesive stamps from Switzerland. 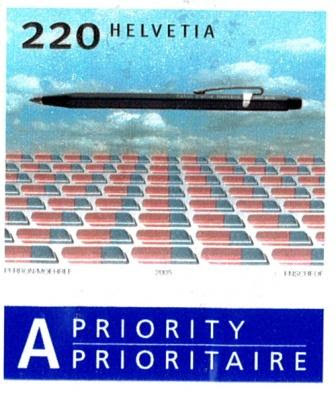 Now, the object on the stamps is of course the Caran d’Ache Fixpencil, celebrating it as a design classic or “Design-Klassiker Schweiz”, “Classiques Du Design Suisse”, “I Classici Del Design Svizzero” according to the printing on the back. Even I can roughly translate those ones into English! I believe this is the first and only mechanical pencil to feature on a postage stamp. I quite like the imagery, it reminds me of one of those military parades – the Fixpencil is the air force fly-over as the rows of erasers (tanks) motor by the presidential stand. Can’t say it’s something I associate with Switzerland. I’m aware of how seriously the Swiss take military preparedness, compulsory military service, etc but I’ve never seen or heard of big military parades. Seems odd now I’ve actually written that. But anyway, those of you who live in or know something about Switzerland – are the Swiss big on military parades? Blogger have finally got their profile searching back up and working. So, I checked out how many others have “mechanical pencils” listed in their profiles. The answer is, there are 60, plus me. I’m a bit worried about some of your other interests though, but then ‘each to their own’ I always say. 40 from USA, 2 from Philippines, 1 each from Burkina Faso, Canada, Macao, Singapore, United Kingdom, Wonderland, and me from NZ. Another 12 have not revealed their hiding place. Seems like penciling is a US thing! or maybe just the internet and blogging? Just for comparison, “pencils” brings up 202 people, and “Pentel” is just me all on my lonesome. I’ve never made any secret of my high opinion of Pentel, and how my Pentel Excalibur was “the one” that started me off down this pencil track, so I expected much from the Classic Deluxe. I write this review in a slump, a “Pentel malaise” if you will, for the Classic Deluxe has not lived up to my expectations, and has not scaled the heights to challenge the revered Excalibur. Photo: Classic Deluxe (top) and Excalibur. Firstly, let’s be fair, by naming it the Classic Deluxe, Pentel have surely set it up as one of the lofty pinnacles of their range. Personally, with that said, and my background, comparisons with the Excalibur are unavoidable, and it would take something pretty special to live up to all that nostalgia. The Excalibur is my yardstick, the one by which all similar pencils will forever be measured. I have two Classic Deluxe, a natural or silver top S55 (0.5mm lead) and a blue top S57 (0.7mm lead). Both have the same chrome tip section, top button and pocket clip, and black plastic lower body section. It is the metal top half of the body section that varies. The blue of my S57 is a very appealing light powder blue, a very nice colour. The “natural” lightly brushed metal finish of the S55 also looks good. The lower half of the body is black plastic, and it’s a slightly unusual shape, being a 14-sided polygon at the top, tapering to round at the tip. Quite interesting. But here’s the thing that I really struggle with. The metal top half of the body doesn’t match into the plastic lower half. They screw together as you would expect, but the diameter of the metal top half is wider then the lower half and so it looks like it is sort of pushed onto the plastic half, and is overhanging. It just doesn’t look right. On something called the Classic Deluxe it just looks cheap and just a little bit nasty. Sorry Mr/Mrs/Ms Pentel Pencil Designer, I really like your stuff, but this just isn’t your best work. Two other things I don’t think look quite right. First is the rather square profile at the top of the body. A little bit of taper at the top would look better – but still, that’s just my humble opinion. The second thing is the lines on the tapering lower black plastic body section are linear up the body, and then the brushed effect on the metal top half is circular around the body. So this emphasises the discontinuity between the sections – your eye runs up the body from the tip and then hits the metal top half – change of diameter, change of colour, 90 degree change of visual flow from “vertical to horizontal”. As I said up above, it just doesn’t look right. OK, enough negativity. This is still a top of the line Pentel, an object worthy of respect. Despite all the above, at a quick glance this pencil does have a fairly nice long sleek dart-like look about it. In the hand it’s lighter than you might expect, and not top heavy. No doubt that’s the thin alloy construction of the metal top half. The pocket clip is one of Pentel’s standard components – good, strong and functional. It won’t be falling off whatever you clipped it to. There is a small diameter, but reasonably long length eraser under the top button. No needle is provided for clearing lead jams. Access to the lead magazine is obtained by removing the eraser. The push top ratchet lead advance mechanism feels good and positive as you would expect from Pentel. 10 clicks advance 5mm of lead. The lead sleeve is a reasonably short 2mm tube, but like many (most) Pentels it is not retractable, so this isn’t a pocket safe pencil. There are no specific grip enhancements on this pencil so its just average in that respect. You tend to feel the 14-sided polygon body shape under your fingers, depending a little on high up the body you grip it. The markings on the pencil are “S55 Japan” and “0.5 Pentel” in bold black printing at the base of the metal body section. So overall, these are still good pencils, but they just don’t live up to my (high) expectations. Best Points – I’m struggling here. The blue body section looks good. Not So Good Points – The discontinuity of the plastic to metal body halves. Dimensions – Length 141mm, diameter 10mm at widest point. Balance point about 70mm up from the tip. Ah well, all good things must come to an end. My holiday in Queensland, Australia is over. Winter in Queensland is bright and sunny, not a cloud in the sky, 25C (77F), not like where I live where it's rain every day and 15C (60F). Needless to say it rained on me as I got home. I must say how impressed I was with the pelicans. They haven't previously taken much of my attention, but I was sitting there enjoying a nice tranquil lunch at the wharf edge table and a Boeing 747 Jumbo Jet flashed by less than an arms length away. Nearly lost my beer. 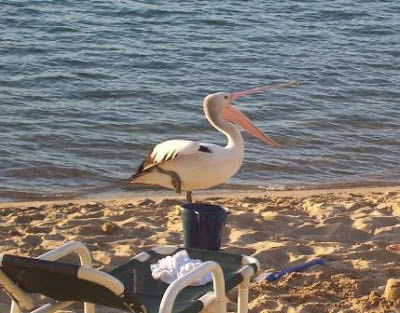 Actually it was a pelican - those things are huge, 'gi-normous' flying things, zooming by at great speed. Very aerobatic for their size. I took a bit of notice of them from then on.